THOUGHTSKOTO Thoughtskoto : Jobs to Australia: POEA Approved Jobs and List of Recruitment Agencies! 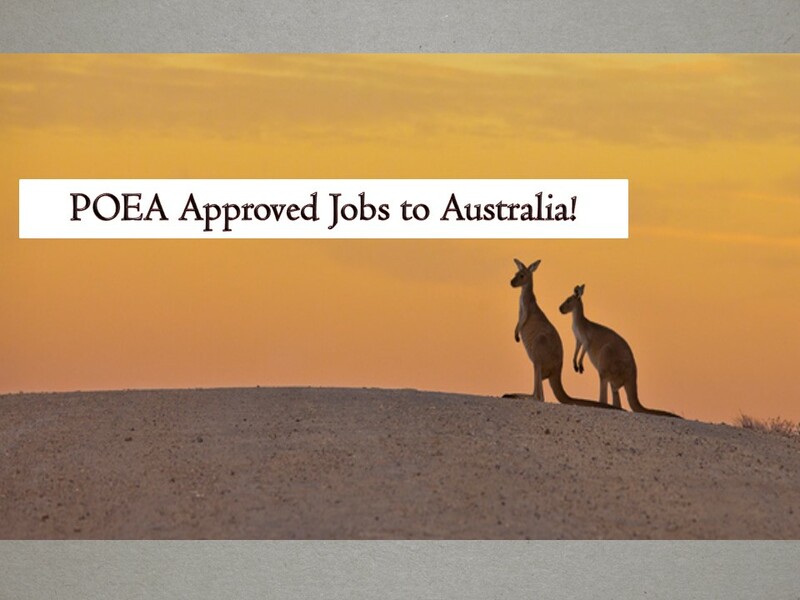 Jobs to Australia: POEA Approved Jobs and List of Recruitment Agencies! The following are job orders from the Philippine Overseas Employment Administration (POEA) to Australia as of April 2019! So if you are looking for job opportunities abroad, scroll down below, one of these job orders may fit on your qualifications. Jbsolis.com is NOT a recruitment agency and we are NOT processing nor accepting applications for jobs abroad. All information in this article is taken from the website of POEA — www.poea.gov.ph for general purposes only. Recruitment agencies are being linked to each job order so that interested applicants may know where to coordinate and apply for their desired position. Interested applicant may double-check the job orders as well as the license of the hiring recruitment agencies in the POEA website to make sure everything is legal. This article is filed under Australia jobs, jobs abroad, IT jobs, Filipina Maids, Filipino workers, Hiring Filipino workers, job site, employment opportunities.